If you know if one of these models uses a 20mm reflector or lens, let me know. That means a 20mm tir lens can be fitted to change the beam shape. If you know it uses a 16mm mcpcb, also let me know. This would make it easy to change the color temp. I will try and continue to update this first post list. Hopefully all the lights will eventually show all the info. Acebeam H30 $140 (21700 5100mah, T shape, xhp70.2 NW and CW, built in type C charging, has red and green leds, 6 brightness levels plus SOS, 4000 lumen! BORUIT RJ02 $10 (18650, T shape, usb recharging, infinite brightness levels, 20mm lens, no 16mm star) Hard to swap emitter, very bluish. Some may notice PWM flicker, but I do not. No LVP, so a protected 18650 is recommended. Boruit D10 (EHL0628) new single led labeled “5000” lumen $11 18650, T shape, usb recharging, 5 brightness levels, 20mm lens, 20mm star) Only has CW, but not as blue as RJ02. No PWM flicker. Has LVP. Fits 17mm tir lens with a little filing. An upgraded successor to the RJ02. This thread gives more details about some of these lights. In h03 may be installed this optics and 45 60 , mcpcb a bit less than 16mm noctigon. The same about H02 . Zl is hard to disassemble but 20mm tir fits. I’m going by regular Gearbest and Banggood pricing. Of course there will always be sales, but I want to show normal prices. but it not good for new people. What are sale prices for these 2? I will include a low and high price. In H03 mcpcb a bit less than 16mm noctigon. The same about H02 . So maybe 15mm? You could buy a 16mm mcpcb and file the diameter down to fit it? For mod based on thеsе flashlights I use 16 mm noctigon mcpcb , but treated with emery paper. So it may be 15.9 or close to it. Another important characteristic is existence of pwm flickering. I know that broit have low frequency pwm . Nitecore, Skilhunt, Zl , Armytek have no pwm flickering. Do you mean the Boruit RJ02? That’s the one model headlight I own. I don’t have any visable pwm. Only on camera does it become visable. Maybe I’m not sensitive to it? Output of h03 more than 1000lm. With out hi drain cell. If it’s not noticable to my eye, I’m not worried about it. PWM is noticeable with any fast object , drops of water is simply example. Are you saying that you see it and it bothers you? I will add a note to the list. Someone just stole my h30, so I am looking to buy one of these two. Could anyone point me to where I could pick one of these two up for around $30? Thanks. You’ll have to look/wait for a sale. I think the H03 and hc30 are about $40 on some Aliexpress stores at the moment, but I don’t see anything cheaper. BTW, stores to watch are Banggood, Gearbest, Fasttech and Aliexpress. I’ve found that if you have an account with them you can put the lights you like on a wishlist/favorite and they will email you whenever those products go on sale. Sometimes it’s an email only sale that only a few will see. You can also contact MadMax and Freeme to see if they have any coupon codes for the lights you want. Also, I’ve seen youtube reviewers post coupon codes in the video description area. Same here, and 120Hz fluorescent lights give me headaches after a while. Check this link, it shows the CW H03R for $33.51 and the CW H03F for $36.57. It’s showing them both out of stock. I’ll keep checking them. Thanks! My bad. I didn’t notice that. Contact MadMax and Freeme to see if they have any coupon codes. Edit, freeme does have a code, but it’s for the same out of stock model. See my earlier reply as I added some more info to it. I just recieved my Crelant CH10, CW version for about $21. It’s really nice. The cool white isn’t as cool as I’d like, but at least it’s not blueish like the Boruit RJ02. Color accuracy is quite good. A 60° tir lens from MTN Electronics drops right in. The all metal construction is very beefy compared to the Boruit. The waterproofing seems better as well. Max brightness is higher. EDIT: Even though max brightness is about 150 lumen due to only 0.18 amp draw. EDIT 2: I took the driver out to look at it then put it back together and now it’s working much better. I got 1.4A and it’s visable brighter. Probably the 460 lumen it’s rated at. I’m not sure I need the 2 different user brightness settings as one seems fine. Having 2 setting means you have to cycle through both to turn the light off, but it’s not that big a deal. It does have a strobe mode when you double click, but I have no use for it. Maybe it’s good for jogging? I’d like to put some switch leds in it to show when power is connected. Then turn the tail cap to manually lock it out. Hi Jason thank you for the list. You need to know if your LED lights require at constant voltage or constant current supplied. second is Make sure the milliamp rating on your LED light matches your LED driver, although there are many different milliamp ratings. Make sure the wattage of the LED driver is higher than the total number of lights. This means if you require for 3 watt LED ground lights, the LED driver you will require will be 12 watts or higher, because 4 times 3 Watts equals 12 watts, if you’re specifying an LED driver for LED tape you need to multiply the wattage per meter of the LED tape, and the length of your rod or room. So if the LED tape is 14 point 4 watts per meter and you have 3 meters you would require an LED driver rated that’s over 40 three-on-two watts, which could be a 60 watt LED driver, such as the Meanwell l PV 60 12 or LP v 6 to 24 depending on the voltage of the LED tape. and lastly make sure the output voltage of your LED driver is compatible with the input voltage of your LED lights. just sharing. I’m not sure your talking about head mounted lights. All the lights on my list are complete units. There is no mixing and matching of drivers and leds. They come as a set from the factory. Maybe your thinking of led strip lights? What about the Imalent HR20 ? I’m thinking of trying this light out because I am wanting a headlamp that bridges the gap between my lightweight reliable long lasting Princetontec Fuel and my 2× 18650 3 emitter maximum output headlamp. I thought I would try a single 18650 that doesn’t have a rear battery pack. The Imalent HR20 looked neat so I did some more digging on it. I now have it on the list. I like the rotary dial and usb charging, but it’s not one I’d buy for close up work due to the L shape. It looks good for jogging at night though, where the 1000 lumen and narrow beam can give good throw. I still don’t know if it has lvp or if it can take a 20mm tir lens. If anyone knows, tell me and I’ll update the specs. I can’t find specific info on the color temperature. They just say 5000k to 6500k. It also looks like it uses a weird, unique shaped copper mcpcb so I’m not sure if it would be possible to swap in another emitter without reflowing it onto the stock mcpcb. Sale price of $28 including battery makes for a very good price. I was noticing my Crelant CH10 didn’t seem as bright as it should be. It’s more than bright enough for close up work like soldering or working on a vehicle, but it didn’t seem like 460 lumen. I did an amp draw test with a clamp meter and instead of getting 1A like advertised, I only got 0.18A at its brightest. That’s disappointing. Now I’m thinking about doing a driver swap. 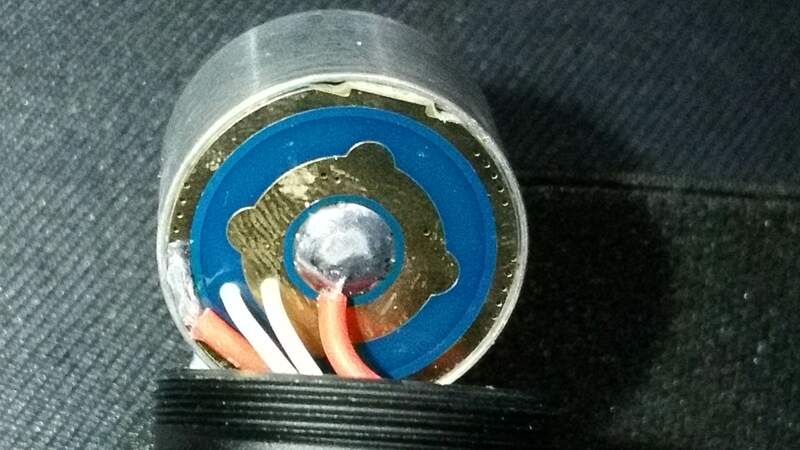 It uses a 22mm driver with the switch wires going through the driver. I might try a fet driver with ramping. Here’s an update on the Crelant CH10. After taking the light apart and looking it over I put it back together and low and behold, it’s much brighter than before. I measured a 1.4A draw on high. Now it’s working like it should. I guess it had a weak connection inside somewhere. I thought it was supposed to draw 1A, but I got more than that. Oh well. No driver swap needed.